I haven’t been working on my Tardis project because I’ve been doing a couple other things. Here is a sampling of them. 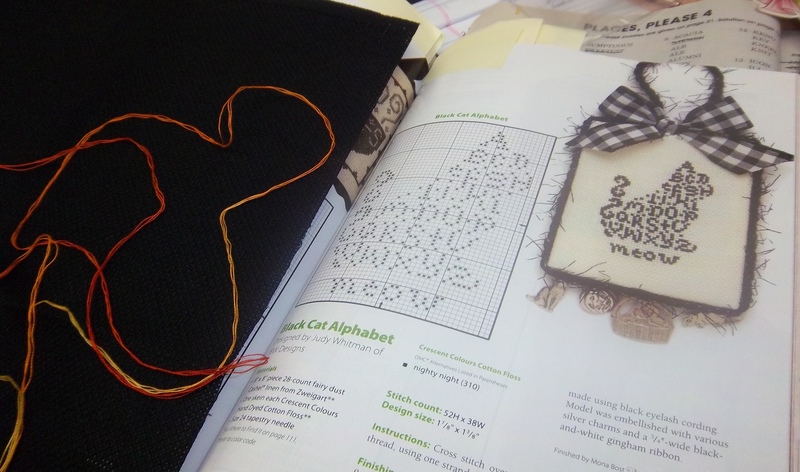 One of the stitching magazines came out with a great Halloween pattern issue. This one shouldn’t take to long. Here is a teaser of what it will look like. This is a rather huge design. This shows about 4 pages of the pattern stitched. 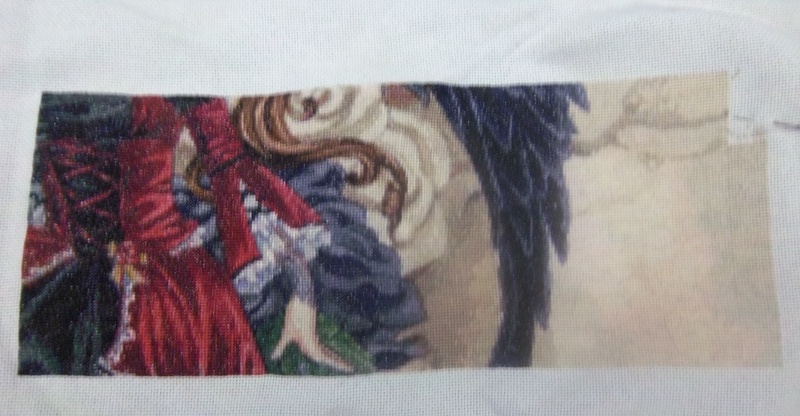 The pattern was made by Heaven and Earth and they specialize in turning paintings and artwork into stitch patterns. 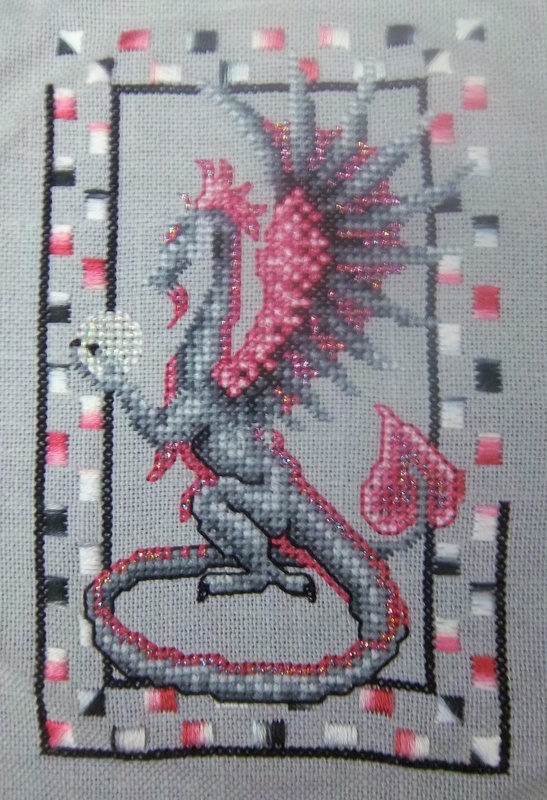 This is about 200 hours of work and it just a fraction of the pattern. Elegant Pumpkins. After I took the picture, I finished the purple swirls and have started filling in the spaces. They are filled with a silver braid. Teresa Wentzler’s Futurecast is almost done. 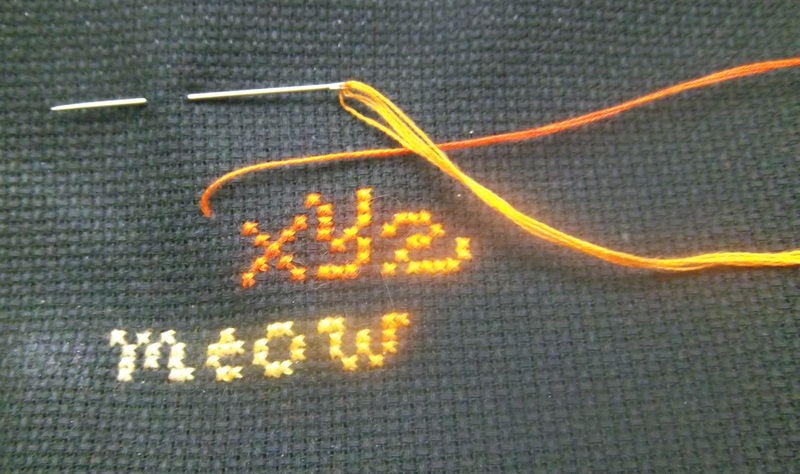 Just the last of the black border and then the back stitching, and last of all, the beading. 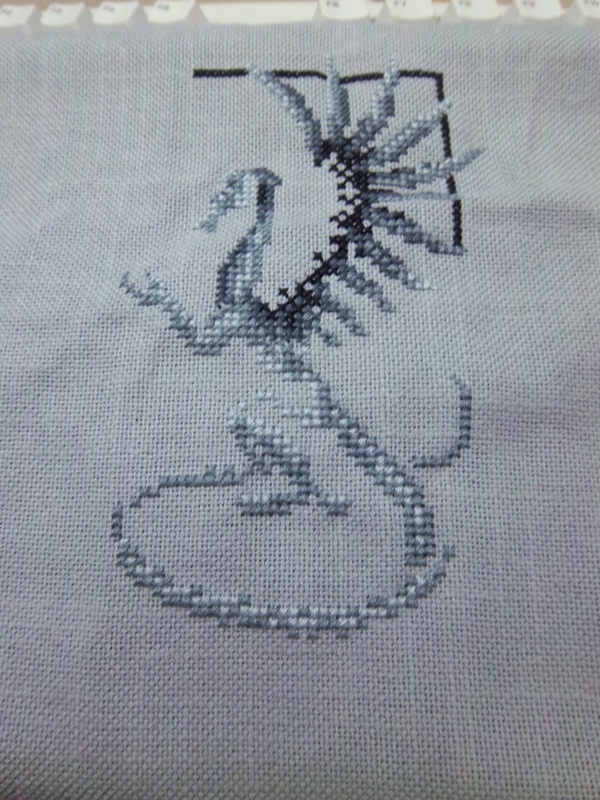 I wanted to get a feel for the dragon so I started the back stitching already. It sure made the clawed back foot pop. 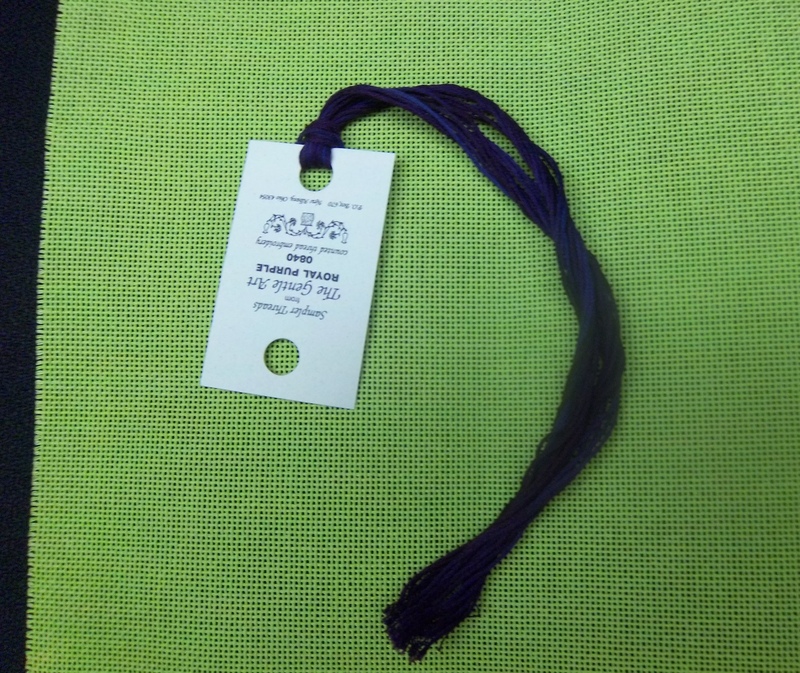 The fabric name is something kind of ordinary like “pretty in purple” or “princess purple”. I can’t really remember. I was thinking about doing two matching Halloween patterns in reverse colors. You will see why I picked that green fiber in a moment. 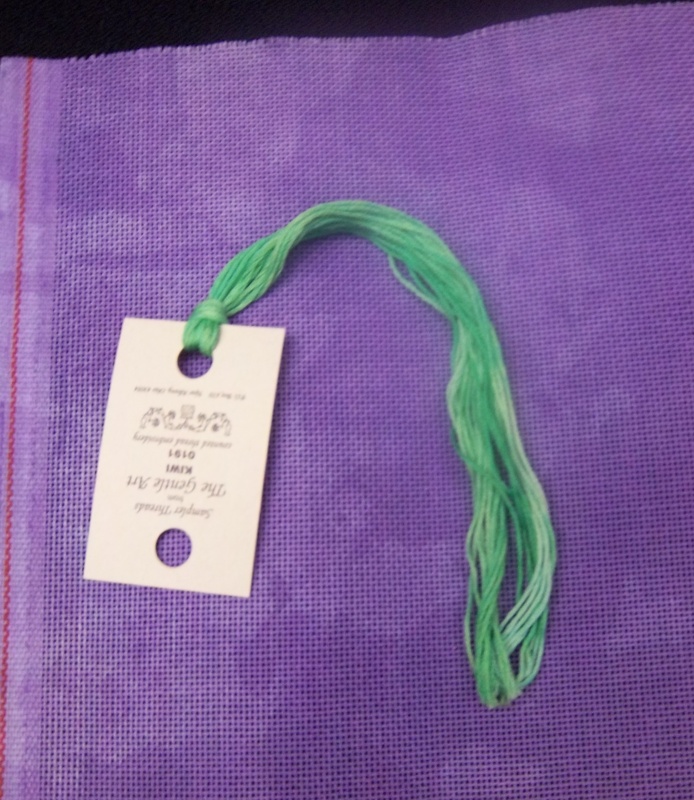 The green fabric was called “Tortured Toad”. I had to buy it for the name alone. I got some purple fiber to go with it. A friend said that instead of doing anything like a couple of pumpkins or cat shapes, I should do two more Tardi in the reverse colors and have a matched set of ‘Halloween’ Tardi. 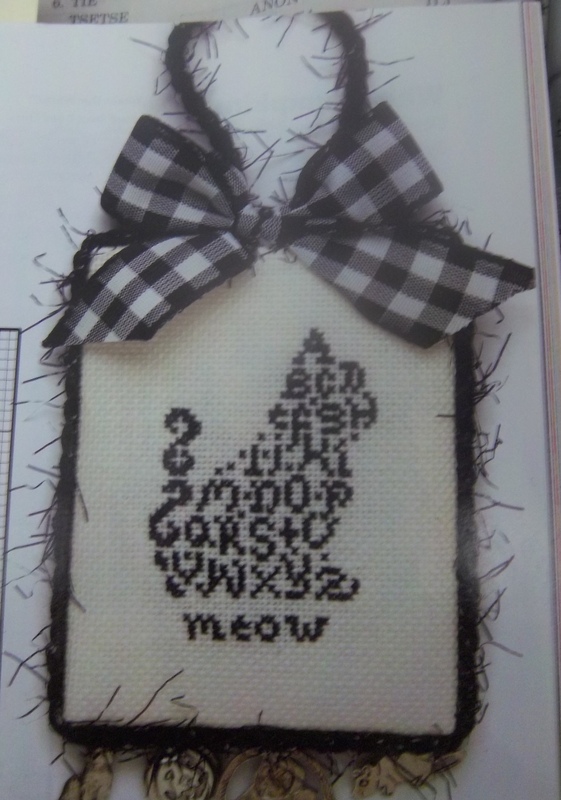 After taking a ton of photo’s, I’ve decided my cubicle is not a good location for taking pictures of stitchery. I had a TERRIBLE time of getting good photos without glare or blurring. My chair isn’t flat but it had the nice black background. But spots that didn’t lay flat tended to blur. I’m going to have to lay things on the table with a black cloth if I want to get good stitched photos. And in a place with enough light to turn my flash off. Some of the fibers and fabrics get a little shiny and reflect the flash. Happiness is . . . Skulls? 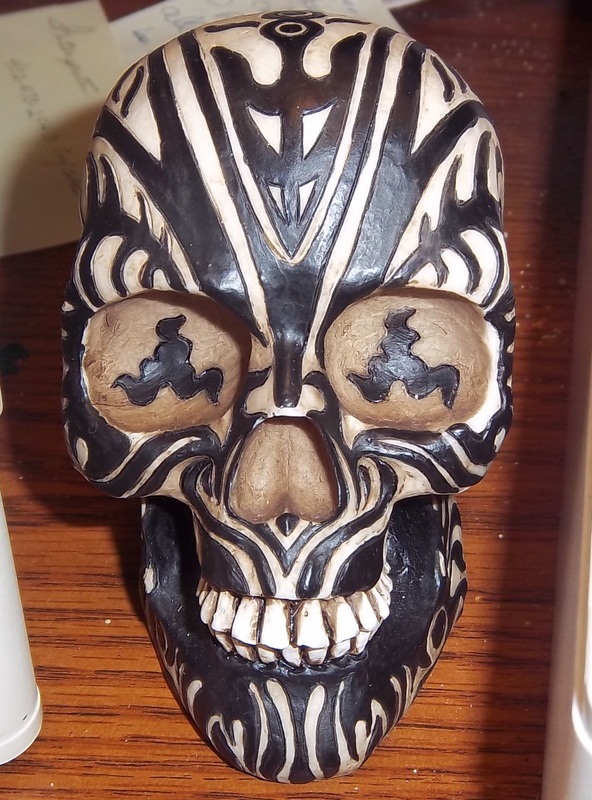 I love skulls. They have a pleasing shape. They are always happy. They never stop smiling. This one sits between my two monitors at work. I picked him up at Christmas a year or two ago and put him under my desk tree but my supervisor told me to take him home. So I just moved him out of my supervisor’s view. They want us to personalize our desk space. 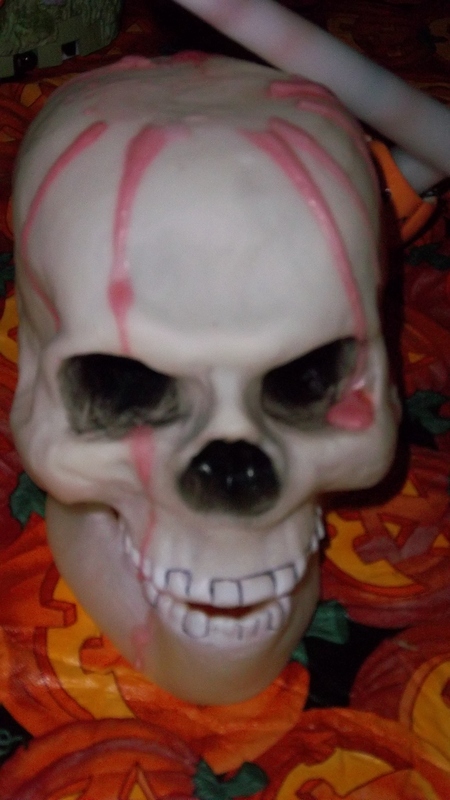 If people can have Husker stuff up I should get to have skulls up. A little corner of happiness at work. After all, they already know I’m Halloween Girl. 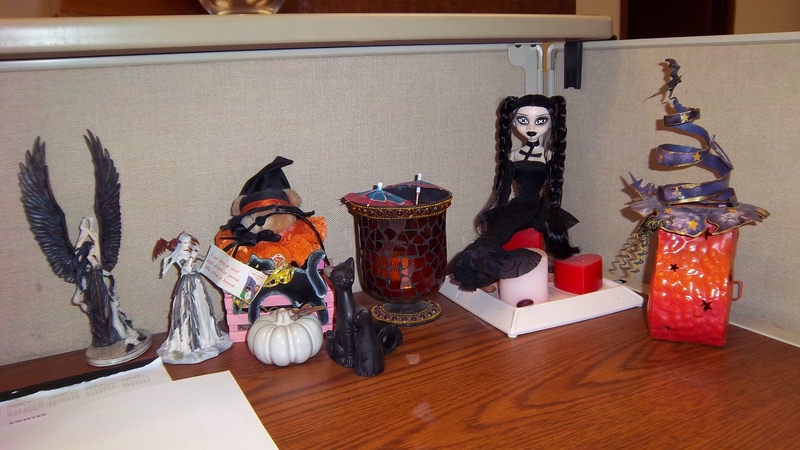 These lovelies live on my desk year round. They have for the past three years. I had more on the desk but brought some home this year. We are moving to a new office at the end of October so I wanted to reduce the amount I would have to move. I usually win scariest costume at our work costume contest each year. Although last year it was for best use of a historical person or some such. Everyone wins. They make up categories that work for all costumes. Although one year they made up two for me and I got two prizes. Too bad I didn’t have pictures of those. They are sitting in the hard drive of a computer that crashed on me. Meet Mr. Happy. I saw him in the grocery store about two weeks ago. My eyes got really big. I smiled a huge smile. My heart filled with joy. I looked at him every time I was in the store up until payday. Then I had to have him. I’m not sure where he is going to live. 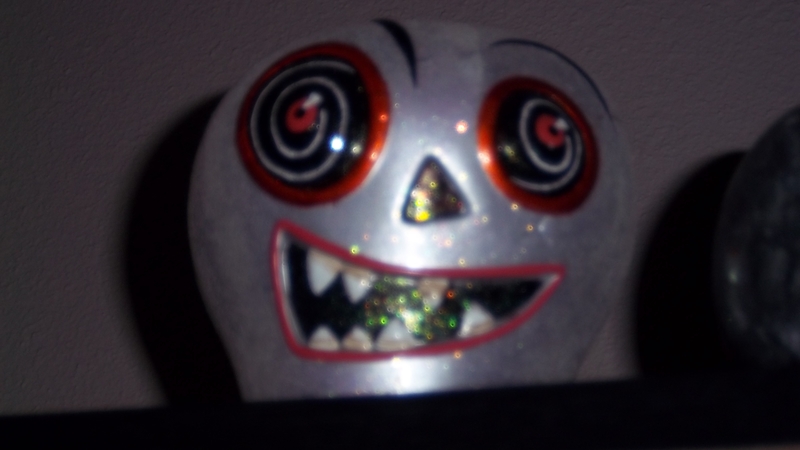 But I probably won’t be putting him away after Halloween. He makes me happy every time I look at him. Which is why he is now known as Mr. Happy. 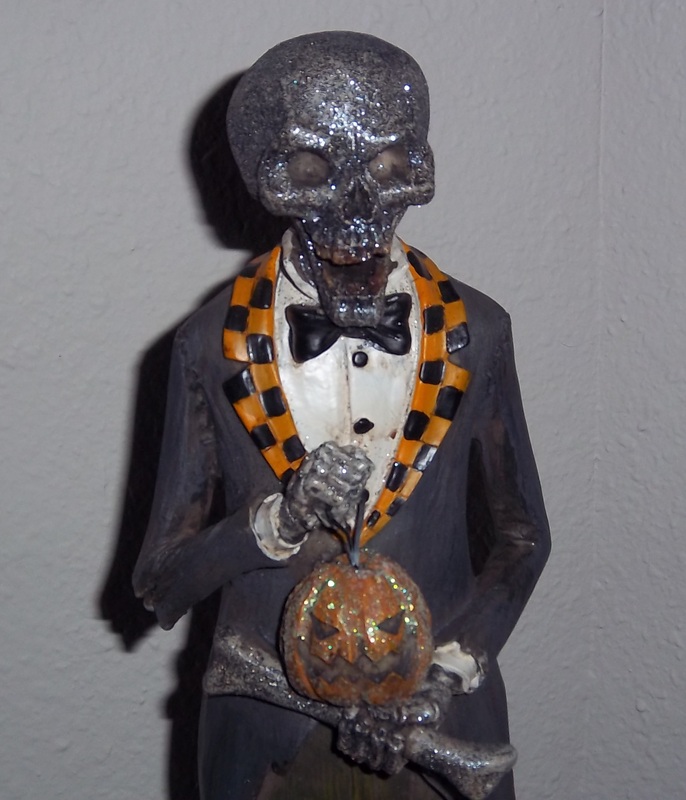 This little number usually has one of the white Halloween candles on top. The ones that drip red. This year I bought one that drip black, red, and orange. 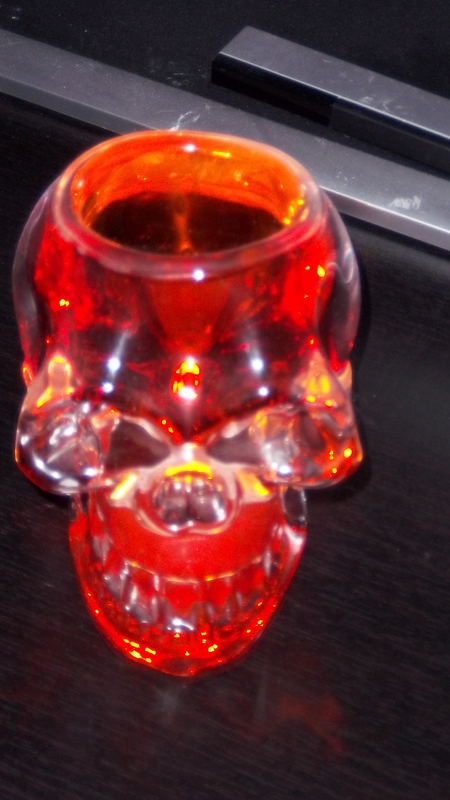 Okay, I also bought a pack of blood drippers as well. I couldn’t resist. I admit that they don’t hold well to the skull. It’s the plastic. Even when well dripped, a good bump will dislodge the candle. I only use the obviously plastic ones because the good ones just look to nice to mess up with wax. I got really excited one year when I found these fairly realistic ones at Walgreens. I’ve bought one each year since then. Three now. 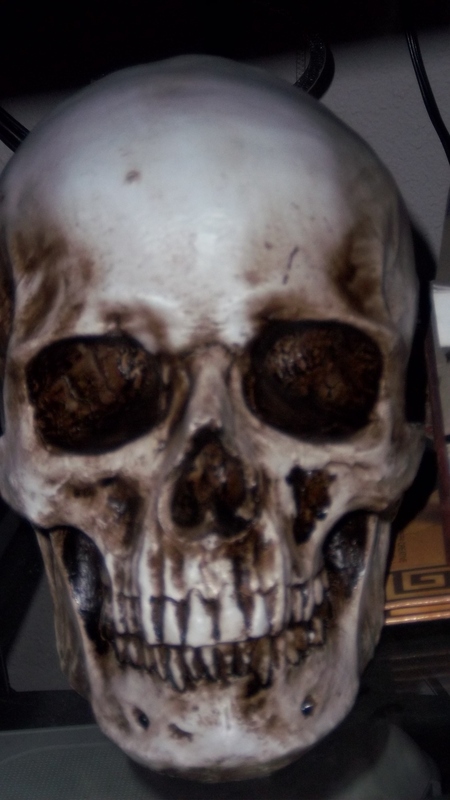 Okay, a more realistic one wouldn’t have the teeth in it and the jaw bone would be a separate piece, but it is still the most real looking skull I’ve ever found for 5.99$. 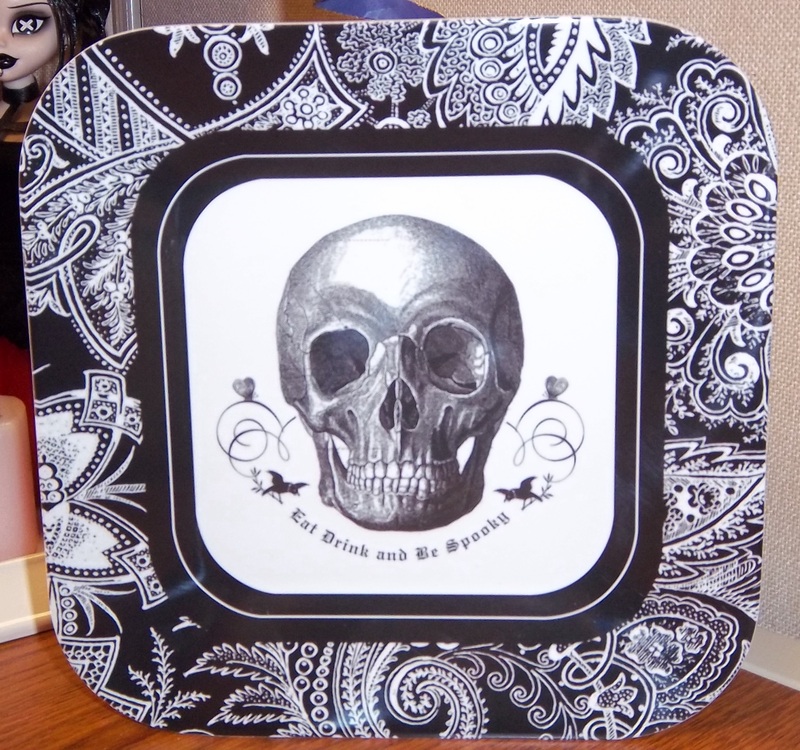 This little plate lives in my desk at work. By now you may have realized my answer to the question, ” Pirate or Ninja?” If you haven’t figured it out, you may need a good thump on the head. This is but a small sampling of my collection. 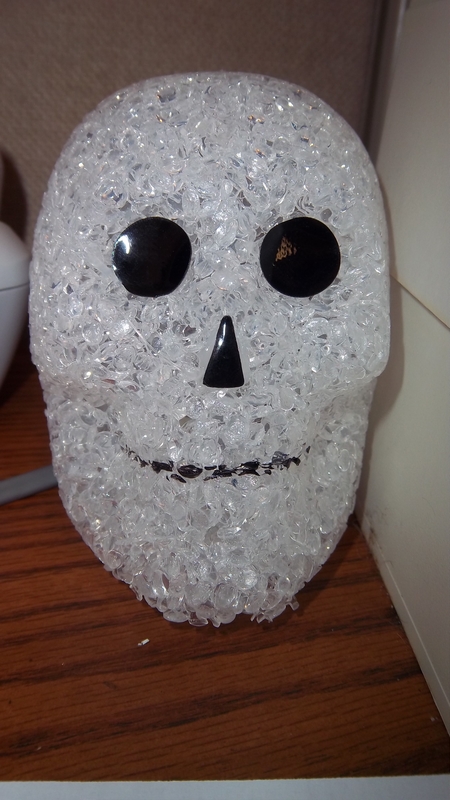 My roommate may regret letting me decorate for Halloween. A large amount of this may never get put back into the storage tubs. Considering his large collection of dragons, my skulls should really be considered an appropriate counterpoint to his collection.